A pretty little iris growing in the mountainous rocky outcrops of Jerusalem is the focus of a research collaboration stretching over 6,000 miles. Scientists at the Chicago Botanic Garden and Jerusalem Botanical Gardens have combined their strengths to study the natural population structure, or remaining genetic diversity, of the rare Iris vartanii. What they have discovered may save the species, and others like it, into the future. The finicky wildflower exists in just 66 locations in Israel’s Mediterranean ecosystem—a dangerously low number. New road construction, urban expansion, and even afforestation in the area have reduced the availability of its natural habitat, fueling the crisis. For a plant that is endemic to, or only lives in, one narrow region, that spells trouble. Do the existing plants contain adequate genetic diversity? And to sustain the species, how many plants are enough? These are the central questions. The scientific partnership between the two gardens was forged when Jerusalem Botanical Gardens’ Head Scientist Ori Fragman-Sapir, Ph.D., who has monitored the species and studied its demography in the field, visited the Chicago Botanic Garden and met with Chief Scientist Greg Mueller, Ph.D. The two quickly saw an opportunity to combine Dr. Fragman-Sapir’s research with the genetic capabilities of the Garden to answer those critical questions. 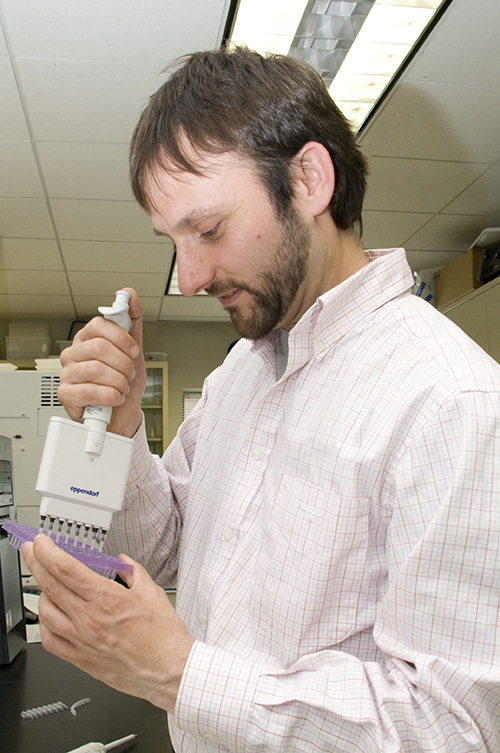 It wasn’t long before Fragman-Sapir began shipping leaf samples to the Garden’s molecular ecologist, Jeremie Fant, Ph.D. Together with his dedicated volunteer Dr. Sirkin, Dr. Fant set to work extracting data from the samples and documenting DNA fingerprints for each plant. Once they had a large enough data set, they compared and contrasted the findings—looking for similarities and differences among the plants’ genetic compositions. 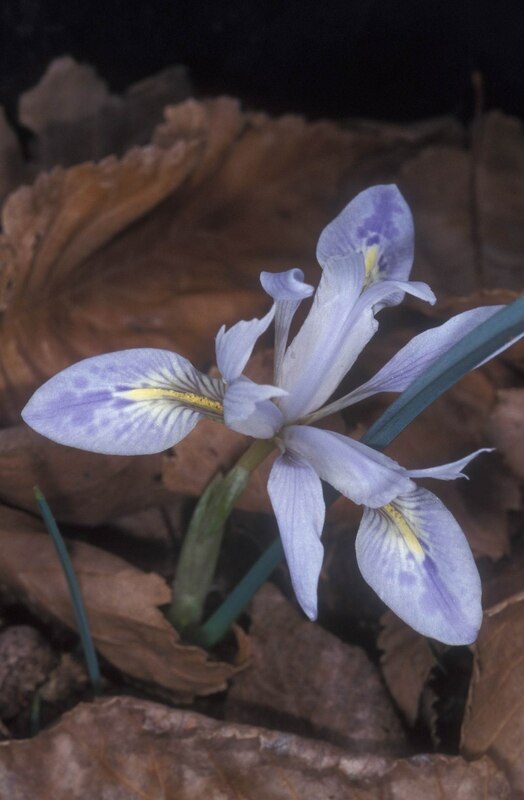 To give scientists a point of comparison, Fragman-Sapir shared tissue samples from five populations (geographically separated clusters of plants) of a more commonly occurring related species, Iris histrio. By also documenting the DNA fingerprints of those plants, which grow in the surrounding area, but unlike Iris vartanii are not rare, Fant was able to determine how much diversity is needed to sustain the species. 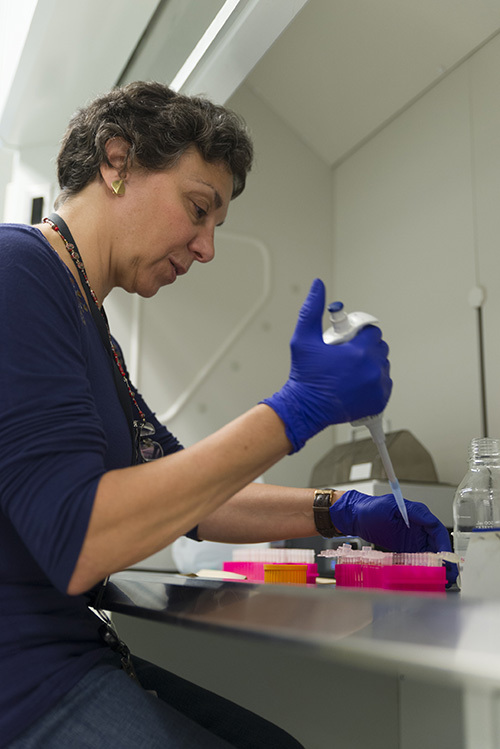 Dr. Eileen Sirkin volunteers in the laboratory. Although the study subject is far away from the Garden, its challenges hit close to home. In 2013, Fant and Sirkin published findings from a similar study on a rare plant found at Illinois State Beach Park, Cirsium pitcheri. For that initiative, they examined the DNA of plants from a restored site at the beach and compared them to the DNA of naturally occurring plants across the range, measuring diversity. “We’re always working with rare and endangered species, and we collaborate with different people around the world to answer those questions,” explained Sirkin. After completing a statistical analysis of Iris vartanii’s DNA fingerprints, Fant made several encouraging conclusions but also issued an alert for continued attention. Especially encouraging was that each Iris vartanii population had significant differences in their genes, likely a result of their longtime separation. The findings highlight that it is all the more valuable to conserve each population for their potential to contribute unique genes to future plants, according to Fant. Although many populations showed high diversity and low inbreeding, which is preferred, others showed the reverse, increasing their potential risk of extinction. The latter group, explained Fant, may benefit from extra special monitoring and care. To conserve the existing populations, attention will need to be given to their surrounding natural areas, explained Sirkin. “If you find a species that people like and you study it and say we need to do all these things to save it, you are not just saving one plant, you are saving an ecosystem, including all the other plants, insects, other invertebrates, lizards, birds, and whatever else is involved in that ecosystem,” she said. The findings and recommendations give land managers a clear direction for their conservation efforts, all because of one eye-catching plant that told the story of many.